In the past three days, we have seen Porcfest attendees successfully applying Bitcoin in real-world usage, with between a quarter and a half of all transactions taking place using the currency. 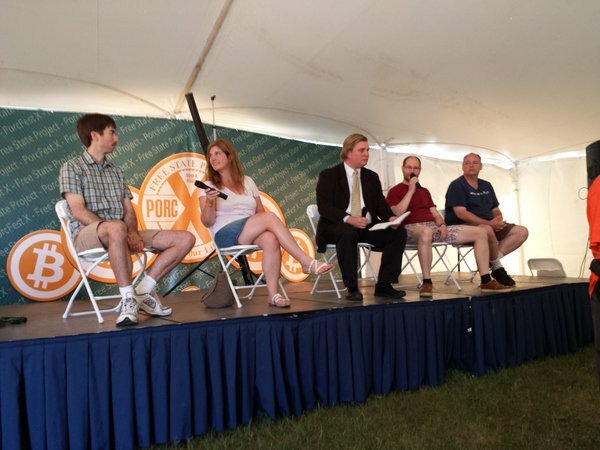 In a practical sense, Bitcoin and Porcfest go extremely well together; Porcfest needs merchants to feed its attendees, merchants need a currency, and Bitcoin is a currency that desperately needs real-world merchants to test it. But what is just as interesting is how well Bitcoin fits in to the core Porcfest ideology. Initially, libertarianism (and its more extreme strand, anarcho-capitalism) was a political movement just like social democracy or conservatism, seeking to secure progressively greater freedom for everyone through political advocacy and elections. More recently, however, many in the libertarian movement have become discouraged by its failures in the political sphere, and over the past ten years the primary focus of many libertarians, and anarcho-capitalists especially, has shifted massively. Now, the Free State Project mode of thinking starts by asking a simple question: if we had a society where governments were much weaker than they are today, or even outright nonexistent, what alternative institutions would we need to ensure that such a society can thrive? Then, given the answer, the solution is to start implementing these institutions today. The result is a holistic anti-authoritarian philosophy that rejects governmental, corporate and even parental authority alike, and seeks to rebuild what it sees as a more peaceful, and ethical, world from the ground up. The contract I had signed with my own temporary landlord in Manchester made clear that it would be enforced by ostracism and public shame, not courts backed by the physical force of law. Because the libertarian and Bitcoin communities are both so tightly linked, even not taking into account basic morality I would not dare ransacking my landlord’s home and running away with as much property as I could even if there was no law enforcing it, simply because I would not risk being publicly shamed and ostracized by both communities at the same time. A political movement which many detractors decry for its extreme individualism proves to be surprisingly communitarian. In a community featuring such a strong presence of alternative, government-free “law”, government-free (and corporation-free) education, government-free private charity healthcare and government-free common defense in the form of an active gun community, what role can Bitcoin take? The answer is, as the basis of an alternative, government-free economy. Gold and silver had been taking on this role before 2012, but now that Bitcoin has appeared there is a very subtle, but growing, feeling that gold and silver are in some sense impure. The security of gold and silver possession is backed by legal property rights, using gold on the internet requires centralized parties that must constantly, and sometimes unsuccessfully, take steps to placate government authorities. Bitcoin, on the other hand, bases its security on nothing but math. Sure, Bitcoin is imperfect, and is vastly inferior to currencies based on gold and silver as a stable store of guaranteed value, but as far as internet currencies go it has one advantage that its potential alteratives do not: Bitcoin is here, now. And it doesn’t stop there. The Bitcoin protocol allows for the mathematically secure execution of complex legal relationships such as assurance contracts, and on top of Bitcoin one can potentially build constructs like smart property, which uses Bitcoin to independently enforce property rights on physical objects like cars, houses and smartphones. All this is not to say that Bitcoin is explicitly a libertarian technology; the fact that Bitcoin would fit well into a libertarian world by no means implies that it benefits nobody else. European Bitcoin activists, for example, often follow what we would term a much more “left-wing” philosophy, although the underlying dislike of some sort of government or corporate establishment often still remains. Liberals, in the American sense of the word, can see a cosmopolitan appeal in Bitcoin from its unrestricted internationality. And, last but not least, ordinary people without any particular ideology at all can benefit from Bitcoin because of its lower transaction fees, near-instant transactions and lack of a chargeback mechanism. For now, Bitcoin can simply be seen as a great social experiment, simultaneously testing the mathematical viability of a decentralized currency, the willingness of the public to adopt an amalgamation of old and new patterns of behavior, and the mainstream financial system’s response to something which has never existed before. 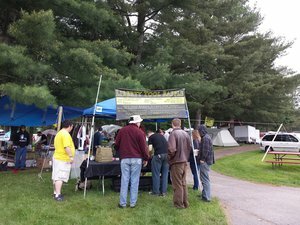 The libertarians at Porcfest, having already embarked on a social experiment of their own, are jumping in en masse. Regardless of whether you are a libertarian or not, the time may be just right for you to do the same.